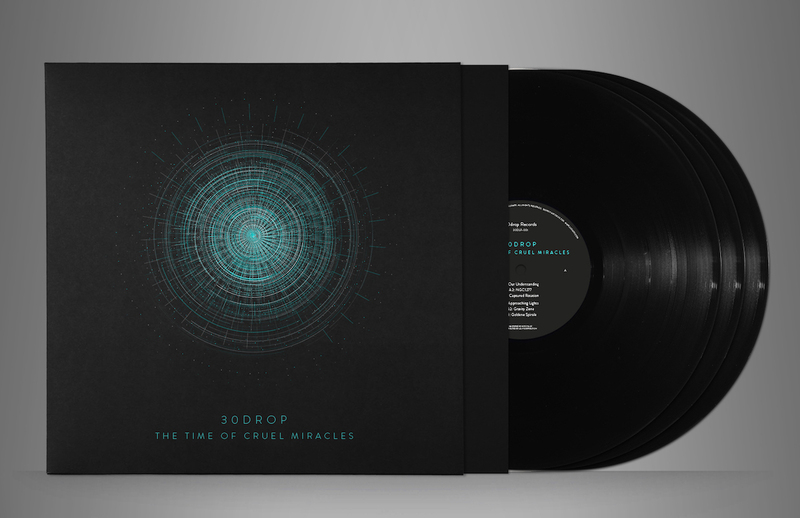 30drop Album: The Time of Cruel Miracles ¡Out Now! It’s time for new and exciting music. A new 30drop’s album forthcoming. Release Date: 17 March 2017. “I did not know what achievements, what mockery, even what tortures awaited me. I knew nothing, and I persisted in the faith that the time of cruel miracles was not past”. – Stanislaw Lem (Solaris, 1961). This paragraph from Solaris, the novel written in 1961 by Stanislav Lem, is the starting point for the concept this 30drop album has been built upon. Science fiction masters like Lem are one of the greatest influences for the artist, who devised this album after the mental challenges that humans should overcome in a future: encounter with beings from other civilizations: capable of interacting with us in a totally unthinkable way so far. Away from what many a sci-fi blockbuster depicts, this work revolves around the idea that such meeting with alien species will be eminently a mental experience that will shock not only our cultural values but also our very own perceptions about what space/time/reality is – a mindbending experience where everything we knew before dissolves around us and propels us to uncharted grounds. Terra incognita so far. Bypassing the “random track collection” syndrome that plagues many of today’s so-called techno albums – this LP was conceived and devised from it’s very beginning as a full, complete work in itself, best enjoyed in it’s totality. A story-telling journey (very much in the tradition of seminal / genre-defining albums as UR’s X-102) were tracks lead you to one another. Tracks can be enjoyed on their own, being all suited for dancefloor and dj-sets alike, but take a complete different meaning when put in the right context within the album. Musically this long-player combines stripped-down rhythms, sweeping pads and hypnotical bleeping sequences woven together in an intrincate but subtle way, a fashion that harks back to the classic minimalist yet complex mid-90’s sound of Hood, Mills and T.Dixon – sounds appealing both the mind and the feet. Classic and futuristic at the same time, this is a compelling journey that opens with the eerie atmospheres of Our Understanding before really taking off with the cadential NGC1277. The hypnotic Captured Rotation sets the pace for the rest of album which oscillates between the exhilarating cosmic groove of Beyond Language and the contemplative stasis of The Mirror. Other highlights include the entrancing Goldene Spirale or the furiously busy Approaching Light. The whole package is further rounded up by a set of remixes which showcase the different directions taken by techno producers this days: from Substance’s solid Berlin-style to Architectural’s spaced-out visions via Rivet’s hard-hitting club bangers and Zero Mass abrassive experiments. Ryuji Takeuchi: Great stuff here! Especially Substance remix for me. Full support. Quail (Soma): Great stuff! loving the Substance remix as well. Thanks! Donor: A lot of great material on here. Remixes too. Thanks. Looking forward to playing many. Arnaud Le Texier: Some great tracks. Nice remixes. Thx. Vidal (Raiz): Feelin’ it. YES. Jeroen Search: Yes very cool! already been playing several tracks, DJ Pete rmx is massive! Sigha: Great stuff, looking forward to diving in properly. David Foster aka Huren (Teste, O/H): Zero Mass mix for me! Electric Indigo: Nice album, some very useful tracks here, thank you! ’Approaching Lights’ and the Substance remix are my favourites. Matrixxman: Hell yes. I need more of this in my life. Richie Hawtin: Downloaded for R Hawtin. Z.I.P.P.O: Nice package, remixes too. Baikal: Great, especially the architectural rmx. Gary Beck: Nice one on the ‘Standard Model’ track, my fav here thx. Birth of Frequency: Nice album. Well done! Jonas Kopp: Great pack, thanks! Antonio De Angelis: Thank you ! Marcel Heese: Great spacey techno album. Thanks! Drumcell: KILLER package of tracks! will need more time to listen to all. Antigone: Looks very nice thx. Takaaki Itoh: Really conceptual tracks! Kwartz: Such a nice LP. Full support. Svreca: Very into ‘Goldene Spirale (Substance Remix)’. Full support !! Dario Zenker: Sounds great the whole package. TWR72: Absolutely brilliant tracks over here… Full support. Markus Suckut: Substance remix is my pick here. Invite: Nice stuff inside. No special favorite to be honest. I will be playing it for sure! Thanks. Sandrien: Yess this is cool, I really like this album! DJ Pete: Very cool bleep techno album. Len Faki: ‘Approaching Lights’ and ‘Standard Model’ are sick! Thanks LF. Post Scriptum: Really digging this package i can already hear couple tracks after first listen. Testing it should be a pleasure. Thanks. Robert Lamart: Another great 30drop release!! Big raw, cosmic and deep tracks… Full support!! Thanks. DJ Hyperactive: Solid all around! Thx. Ben Sims: Plenty of solid cuts on here, big thx! Pfirter: Nice album, lot of music to check properly, thanks for sharing. Exium / Kessell: Good stuff, thanks. Angel Molina: ‘Beyond Language’, ‘Our Understanding’, ‘Goldene Spirale (Substance Remix)’, ‘NGC1277 (Architectural Remix)’, ‘Stadt des Orion (Rivet Remix)’… A bit of everything and very interesting. As expected, my support! Thanks. Lenny Posso / Serif: Pure fire! I can’t even pick a fav… It’s full on! Developer: Will play some of these fo sho!!! Gracias. Cosmin TRG: Sounds great on first listen, going to dive deeper into it. Thanks! Distant Echoes: A lot of good tracks to play, especially Zero Mass rmx. But the Architectural track is wicked! Aiken: Great music!! Will play for sure. Ben Gibson: Substance remix for me – thx. Dasha Rush: Like it! Thanks. Blawan: Really nice techno long player! Full support. Audio Injection / Truncate: A lot of dope tunes in here! Thanks! Yac (I/Y): All killer, no filler here. Trevino: Very very good. The real sound of techno. Excellent production. Kr!z: Full support, some great music here. Denise Rabe: The Zero Mass Rmx is my fav. Nice balanced album. Agoria: Downloaded for Agoria, thanks for the music! Dimi Angelis: Substance remix for me, thnx. Doka: Thank you! Some cool tracks in here! Voiski: First attracted by the names of the remixers, but in the end surprisely really into the originals ’Standard Model’ in particular, good album overall. James Ruskin: Looking forward to listening to this properly….Thanks!